Several years ago I faced the crushing news that my 10 month old son had cancer, would require surgery to remove his kidney and the tumour attached to it, and that he would be subjected to 6 months of chemotherapy to ensure all the cancerous cells were destroyed. I had driven by that hospital countless times never thinking about what actually went on there, the lives impacted daily or the challenges both families and staff faced as they cared for those in need. We received donations of things like a duffel bag filled with items that may be helpful with a hospital stay (because when you’re in crisis you don’t always think of the little things). Volunteers from different organizations provided support in so many ways, including information that led to a wish being granted and my son having his dream come true – meeting Mickey Mouse (I wanted him to go swimming with the dolphins but…..)! In times when things look bleak and emotions are drained, charitable organizations that are established to support families like ours are invaluable. I cannot begin to tell you how much all the little things meant throughout the healing process. The donations that made those little things part of our reality were priceless gifts. At that time my son’s prognosis was very good – a 96% chance of survival. Ten years prior to that, the survival rate was at 10% for his type of cancer, a far cry from the good news I’d been given! The education I received throughout those months created a new awareness of just how much research and development means to those in the future. Crucial donation dollars are to so many, aspects of the process and the effects on the quality of a person’s life. Suffice it to say my outlook has been forever altered and my compassion for others is pretty apparent. Taking on this role with Donate A Car Canada has provided an opportunity for me to see firsthand how lives are changed and impacted through the donations of others, and to facilitate an avenue of giving that isn’t often considered. Within each one of us is an innate desire to help others and to make a difference somehow. In an environment where ‘giving back’ seems to be the buzz word, many people are left wondering how they can do that while trying to make ends meet themselves. As we endeavour to look after our environment, change our habits and find a way to give back, Donate A Car offers a great alternative for several reasons. 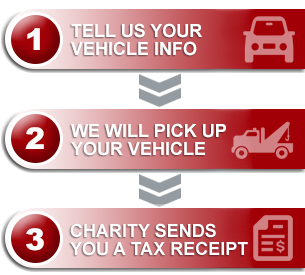 Donating your vehicle does not require a cash outlay, but generates a charitable tax receipt. Donating through our program affords you the opportunity to give to the charity of your choice. If you don’t see the charity you are passionate about listed in our registry, you can provide their information in the notes and we will pursue getting your charity registered with us. All charities listed are registered and are in good standing with the Government of Canada. We secure environmentally friendly services when recycling a vehicle is required. Free towing service is available in many locations throughout the country and if we do not have an agent to assist in retrieving your vehicle, we will do what we can to look for one. Charities do not pay any fees whatsoever to participate in our program. One of my most rewarding activities at Donate A Car is generating and sending cheques at the end of each month to our charities, knowing that we too are making a difference in people’s lives both nationally and internationally. It’s a pretty cool feeling. You may never fully know the impact you are having on others through your donations but believe me when I say, we who are on the receiving end of your generosity are truly grateful!